When you think of Liverpool you think…The Beatles, shell suits, The Cavern, the docks, football, good (or not so good!) ol’ Brookside and if you’ve been around this blog long enough, you’ll be thinking about a Liverpool gin or three too. But what about the food. Liverpool is absolutely full to the brim with amazing restaurants and bars serving up some of the tastiest treats you could imagine. From traditional dishes to pub grub, fusion, mile high burgers and every topping imaginable on a pizza, there is sure to be something to tickle the tastebuds. However, if you’re looking for a real taste of Liverpool there is only one dish, in my eyes that truly tastes of Liverpool, and that is scouse. Ask anyone from Liverpool what they’re favourite dish was as a kid, or how they feed themselves warm when the colder months set in. I bet you a whole plate of cookies (because I have more cookies than pennies!) that the majority of them will tell you scouse. For those of you who don’t know about our great traditional scouse, it’s generally made up of beef or lamb, stewed in gravy with potatoes, onions and any root vegetable you can get your hands on. It’s been around since the 18th Century and was (so the theory goes) brought to the ports of Liverpool by sailors who used to gobble it up on board with salted beef, onions and pepper. Thankfully the original recipe has improved somewhat and the dish is not only flavoursome and hearty but pretty darn good for you too, depending what you lob in their of course. Fun Fact: it was originally known as lobscouse, because you quite literally lobbed (chucked) in whatever you had left in your cupboards into the pot and boiled it up! 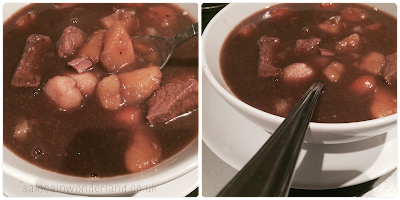 You’ll find a few variations on scouse as you look around the web but this is how I like to make it! Peel and chop the carrots, parsnip, swede and potatoes. Make sure you cut them up into thick chunks. Peel the onion, chop in half, then quarters. Put all the veg in a pan with 500ml water and bring to the boil. Brown off the beef in a frying pan with a little beef seasoning and extra virgin olive oil. Once the veg is boiling, add the beef and let it bubble for about 5 minutes, adding the cornflower, gravy granuals and beef stock. Bring it down to a simmer for 2 hours, stirring occasionally. Serve piping hot with fresh warm bread smothered in butter. The next time you visit Liverpool, make sure you get to taste a fair few of our local delights and pick up some local fresh produce to recreate your own taste of Liverpool at home. *This post was written in collaboration with Travelodge. All thoughts, opinions and ramblings are 100% my own. For more information, see my disclaimer policy here. We should do a scouse come dine with me! Ahhh that would be amazing! We could have a scouse-off haha! I think you will love it and your a much better cook than me so I bet it will taste even better! 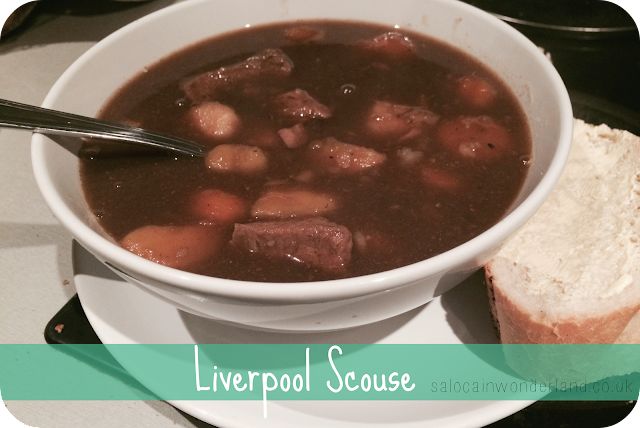 I'm not familiar with Liverpool Scouse, honestly, but I can't believe I'm not; it sounds absolutely delicious, Saloca! Whaaat! You need to get on this and get your scouse on! Such a warm and hearty meal!